Jonathan Alcorn/ReutersBlack Friday madness is imminent. Black Friday is nearly upon us. Visa Europe says that this year, Britons are going to spend £6,000 per second. The online retailer is the father of Black Friday in the UK. Its offers changing daily deals and runs all week; they finish on November 30. Today, until 13.40pm, you can nab an iPhone 5 32GB for £329 — 23% off. There are also One Direction action figures and headphones with up to 70% off the asking price. Owned by American retail giant Walmart, ASDA joins Amazon as one of the main companies behind Black Friday’s introduction to the UK. Its discounts start at 8am on Friday and this year will it will also host a second sale on Saturday. As of Thursday morning, one offer is a 40inch flat-screen TV for £139. Ever mysterious, as of Thursday morning Apple was yet to reveal what its reductions will be. In the US, the company is giving away gift cards with purchases — but there’s speculation that the UK will get price drops instead. The department store is home to more than penguins. Right now, its Black Friday page only hints at what’s to come: “For one day only, we’re bringing you hundreds of offers across electricals,” it says. The stores open at 8am on Friday and its Oxford Street branch will be trading until 10pm. Argos’ discounts are on a timer and start at midnight. 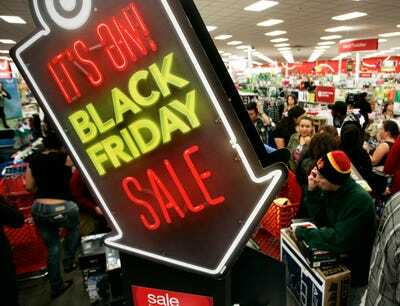 Customers can reserve online and pick up “Black Friday bargains” instantly in store. Gamers take note, this year the company will make “hourly announcements” from 6pm on Thursday. One sneak peak is FIFA 15 for £31.75. The complete sale begins at midnight and in stores from 11:59pm. The computer retailer brands its Black Friday sales as a “Black Tag Event”. Its offers start at 8am on Friday, but it’s not clear whether reductions will also be available online.